Introduced in Spring 2015, the Sony 90mm f/2.8 Macro G OSS lens is an FE-mount lens for telephoto and macro work on the Sony mirrorless bodies. When used on the E-mount A6300 and other crop sensor Sony cameras it will be an effective 135mm. The 90mm f/2.8 is not a small lens at 5.1” (131mm) without the hood mounted, nor is it a light lens at 21.2 ounces (602g). Physically, the lens is more appropriate for the A7 series cameras than it is the A6xxx series cameras, but I used the lens on both E and FE models. It’s just that on an A6300, for instance, you’re going to have a front heavy situation and a lot of protrusion from the camera that you might not be used to with the smaller and lighter lenses that Sony tends to offer for the crop sensor cameras. Focus goes down to 1:1 (life-size) with this lens, or if you prefer measurements: 0.92 feet (.28m). 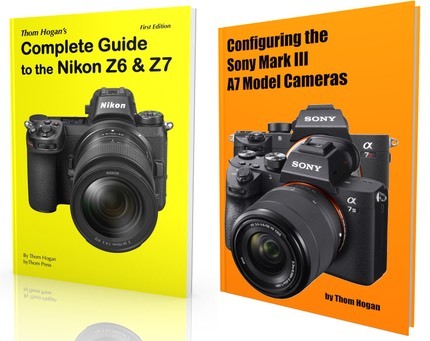 Life-size means that an object 24mm across in real life will be rendered across 24mm at the sensor (I use 24mm as an example because that’s the width of the A6xxx and crop sensor Sony cameras; the A7 series is 36mm across). Put another way, a 24mm-sized object at the closest focus distance will render completely across the entire A6300 frame, while a 36mm object will render completely across the full A7 frame. The latter would be useful for very close macro work, the middle option is probably the best option to use for general telephoto work (more on that in the performance section as to why). The focus ring goes from minimum to maximum focus position in about a half turn, giving you plenty of intermediary focus discretion. The lens hood is a bayonet type that can reverse onto the lens. Two other controls are on the lens: a switch to turn the built-in OSS system on and off, plus what Sony calls the Focus Hold button. The Focus Hold button is programmable (62! options on the A7rII). It’s position is correct for small to medium sized hands when bracing the bottom of the lens with your palm: the button will be almost right at where your thumb is. Unlike many of the lenses with these function buttons, there is only one such button on the 90mm f/2.8, not multiples. The G designation is Sony’s intermediary level of lens (GM being the highest designation, no letter being the lower designation). Sony’s page for the lens is here. The lens sells for US$1100 and is made in Japan. My review is based upon one sample borrowed from B&H and used for a month in my work. I've also verified other samples via loaners from Sony. Sony has adopted the push/pull of the focus ring to move the lens from autofocus to manual focus. In the pull (back to camera) position, the focus ring is directly and apparently mechanically coupled to the focus elements in the lens, something still a bit unusual in the Sony world, which has been focus-by-wire for the most part. I actually like this design, especially coupled with Sony’s default “magnify when focus ring turned” setting. Most of the time my 90mm’s focus ring was in push (forward from camera) and I was just autofocusing, as usual, but a quick pull back and twist and I’m manually focusing with a magnified view. Nice. I’ve read all kinds of claims about how mirrorless is better than DSLR over the years, but this automatic magnification when manually focusing is one of the real things that mirrorless can do that DSLRs can’t. And it’s exceedingly useful. The drawback to this is actually not a lens issue, it’s a camera issue. If you want to move the magnified position as you’re focusing, you need to use Sony’s small and somewhat cheap Direction pad. That’s not glove-friendly, nor is it particularly positioned well. On a tripod, that’s not an issue. Running around handheld doing macro work with OSS turned on and trying to hold the camera steady while using the Direction pad it’s an issue, in my opinion. But again, this isn’t a flaw of the lens. The focus ring is at the front of the lens and easy enough to find. Personally, I’d prefer a rubber type ring rather than the knurled plastic, as in wet conditions the ring can get a bit on the slippery side. As noted earlier, the Focus Hold button is really only positioned for one handholding position, but that doesn’t bother me at all because it’s exactly where my left thumb sits on the lens when I cradle it. The overall finish of the lens looks very nice, but it appears to be a lot of polished plastic, which some will probably find fault with. I don’t. There is a bit of a hollow sound as you tap on the lens barrel, but why would you be tapping on the lens barrel? Autofocus: If the 90mm f/2.8 macro has a weakness, I’d say that it would be with autofocus performance. At moderate to long distances, the lens performs pretty much as you’d expect. Much of the time in those instances there’s a snap to the focus performance, especially when the change in distance isn’t dramatic. Occasionally, though, I get an overshoot and recall before focus is established, especially in low light or low contrast. But going from normal shooting distances to close—especially if you’re crossing the gap from far to close—the lens has a tendency to be what I’d call leisurely. More importantly, I’ve encountered numerous circumstances where the lens will pass the focus point, hunt, then ping pong back and forth before it locks into a focus point. In low light and low contrast, this problem is clearly evident at close distances. You can mitigate the problems by using the range switch on the side of the lens (e.g. 0.5m to infinity for normal use, 0.28 to 0.5m for close use), but they never go away completely. More so than any other Sony autofocus lens I’ve used to date, the 90mm f/2.8 will have a tendency to over/undershoot and retry, which makes capturing fast movement or fleeting moments trickier, if not impossible in some situations. This isn’t terrible autofocus performance. It’s a combination of things, I suspect: slower aperture, longer focal length, more movement of the focus element(s), and the fact that the phase detect system on the Sony cameras needs a final contrast detect lock-in before focus is established. Some combination of those things is being stressed on the 90mm f/2.8. Indeed, more so than on the 70-200mm f/4, so it’s probably not aperture related. Of course, I don’t tend to autofocus at close distances with a macro lens. That’s where a pull on the focus ring and a look at the magnified zoom is far faster and frankly better than using the autofocus system. So I’m not going to say that a big move from far to close is a real issue with this lens; it’s something to be aware of and use an alternate approach. That said, the 90mm f/2.8 is definitely not the snappiest autofocus lens in the Sony corral. My 70-200mm f/4 is definitely faster at focusing in the same conditions. But macro lenses generally have focus elements that not only move further than “regular” lenses, but also often with much finer and precise movements. Note that it takes almost a half turn to go from near to far focus; the internal drive cam for the focus elements is likely longer than we see in other lens designs. It would take a far more powerful motor to equal performance, if so, and I don’t think the 90mm f/2.8 has a more powerful motor than the other Sony G lenses. Sharpness: Zowie! In terms of the FE lenses I’ve used and tested to date, the 90mm f/2.8 macro is the sharpest yet on my A7rII, particularly in the central region, where it provides very impressive sharpness wide open. Beyond what I’d normally call “excellent.” That said, f/4 is the best aperture on this lens, though you have to go all the way to f/5.6 to get the corners to their best level. This is a tough one to call. Technically, we have some lenses that perform in the center at the level the 90mm does in the corners at f/5.6. So does that make the corners excellent? I’m hesitant about that kind of label, because people will misinterpret it. I generally haven’t written about this phenomena in my reviews, as the disparity between a beyond excellent center and merely excellent edge isn’t often encountered. Virtually all lenses have some contrast and acuity drop-off as you move from center to edge, and many also throw in a ton of astigmatism to make things worse. It’s a bit like the 90mm is designed to a higher standard, but operating “normally”, so we get this stellar central region with edges that aren’t up to that level, but still pretty darned good when you look at the measurements they’re attaining. On the crop sensor bodies the range of the central sharpness pretty much extends to the edges of the frame, though it misses just enough so that the extreme corners do show some falloff. But I’d have no qualms calling the 90mm f/2.8 excellent on the crop body Sony cameras. I didn’t see any meaningful field curvature or focus shift to worry about, by the way. I’d tend to say this is a sharp lens and leave it at that. But if you won’t let me leave it at that, then I’ll go on and say that, as with any lens you use for telephoto or macro distances—two perspective extremes—you’re not likely to notice the falloff towards the corners in sharpness. Distant subjects flattened by perspective tend to benefit from both vignetting and a centering of sharpness, as it forces our eyes to the subject (as long as it’s not extremely off center). Meanwhile, in close up work, I actually prefer some falloff in the corners to further emphasize the depth perspective. Let me put it a different way: I can’t imagine the person that’s going to find the sharpness capability of this lens less than satisfactory. Chromatic Aberration: I was surprised that latitudinal chromatic aberration was well controlled. Likewise, longitudinal chromatic aberration was fairly low for this type of lens, and mostly disappears if you stop down. Vignetting: in raw files there’s about 1.5 stops of vignetting wide open, which reduces to about two-thirds of a stop by f/4. Nominally, you need to get to f/5.6 to get vignetting below the level I generally call ignorable. With Sony’s in-camera corrections wide open shooting is reduced to about two-thirds of a stop vignetting, but as you stop down it really doesn’t change the characteristics at all: both raw and corrected JPEG are almost identically from f/4 onward. Linear Distortion: in raw files there’s less than 1% barrel distortion. Slightly visible. With Sony’s in camera corrections, this mostly corrects, but it overshoots slightly into pretty much invisible pincushion distortion. Bokeh: I see some onioning overall and some elongation when stopped down, but there’s nothing particularly annoying about out of focus highlights. They tend to get a bright rim to them (part of the onioning), but otherwise the bokeh seems fairly benign to me. It’s not creamy smooth, but it doesn’t really call attention to itself other than the bright rim. Gee I wish all lenses were this good optically. It’s really difficult to find a fault with the 90mm f/2.8. Yes, we can find slight weaknesses by pixel peeping and measuring, but in terms of actual image results, I’m going to go out on a limb and say that you’re simply not going to be disappointed with the results this lens produces. They’re crisp, contrasty, and devoid of any significant visual problems. As a general purpose telephoto lens, yes, the 90mm f/2.8 can be that, but if that’s all you’re using it for I think you’re going to think the price high (especially when compared to some DSLR 85mm f/1.8 lenses). I’m not sure that the basic optical goodness coupled with the large size and weight justify the price as a purchase for basic telephoto work. It’s really the macro aspects of this lens that start to make the price seem more reasonable. With a 1:1 capability and such impressive sharpness in the central region, I’d say the Sony 90mm f/2.8 is right up there with the best moderate telephoto macro lenses I’ve used over the years, and those were excellent lenses. The only weakness, as I pointed out, is the autofocus performance when you push the lens from one end to the other of its focus range is not going to impress you. My final words are these: if you need what this lens provides focally, buy it. I can’t imagine it disappointing you. Update: corrected a value for close focus. Added second sample source.